USB programming lead complete with software drivers. Suitable for use on Windows XP, Vista,Windows 7 and 8. Programming software is available free from the following sources. Chirp (highly recommended programming software). 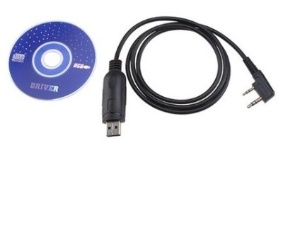 A great source of information and helpful advice including user manuals and Prolific driver software for the usb programming cable is available on the Yahoo Groups site baofeng_uv5r. You will find these on the links page.